Here is the picture I got from Pete showing a hole drilled into the end of the mast. On the jacks that I have here the hole is drilled on the same side as the lever for up and down on the mechanism. So if it's laying on the non lever side you don't see the hole. I'll get a pic of mine and post as well. When you take the pictures of your Superbird jack could you get a nice one of each side of the mechanism. I'd like to see the date code, "UP" and "DOWN" and all the other details stamped into it. Here are two pictures of my "T" mast bumper jack. The first is the non lever side and you don't see the hole that's drilled. The second picture with it flipped and you see the hole. So in some of previous pictures like the one off Nick's site there could be a hole drilled in the mast. This is what was in mine. Long jack hook with U71 stamped under. Jack has a 0M stamp on the rivet. Different base and it’s not a T style. Mine might not be original to it? Not sure. Pics won’t upload. if someone can upload them for me I’d appreciate it. John,I see one thing that may be incorrect or maybe mine is wrong but it came from the original owner. This is what was in mine. Long jack hook with U71 stamped under. Jack has a 0M stamp on the rivet. Different base and its not a T style. Mine might not be original to it? Not sure. Pics wont upload. if someone can upload them for me Id appreciate it. I sent you a pm on your pictures. The wing nut VS the nut on the scissors jack hold down plate? Mine has the wing nut. is the length of the post confirmed & consistent? Here are the pictures of your jack you sent me. Your date code of 0 M on the rivet works out to be December 1970 which is a year after your Superbird was built. So I think this jack was a replacement sometime later. We are not consistent on the jack yet let alone the length! From the ones that I think are right it should be 36 5/8" end to end. Sorry John - I meant to take pics and measurements this past weekend. I will do it this week for sure. positions of the scissors jack, jack handle and hold down plate with wing nut. Other than the hook with the part number 2931 103 stamped into it I think the base will be the next item we can agree on? In my first picture I show my 4 "T" or "Y" mast bases and I think they are identical except for the conditions and colors. The one in my second picture on the left is a Chevrolet jack base! The two in the middle shown in my third picture are Mopar jack bases! Last is my favorite on the right shown in my last picture. It is a Ford jack base that I bought NOS for $27.99! WOW! The Mopar junk jack bases are all the way up to $99.00!! If you look close they all have the same slots and holes along with a A-B stamped into them. The big hole stamped into the right side is for other makes that use a wheel stud hole in the rim for the hold down stud. So with the base used on all these differant applications they are EASY to find! We still need original owners/Superbirds jack pictures. Ok - finally was able to take pics. The jack length is 34-1/4" long. Note the hole in the shaft - probably to hang the shaft for painting. I have included some other pics for general layout. 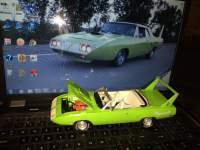 Thanks for all the pictures of your Superbird jack! 1) The Superbird uses a "T" or "Y" type mast. 1) The length of the Superbird jack mast has been reported as 36 5/8" and now 34 1/4"
2) There are at least 3 styles of mechanisms in play in the summer/fall 1969! This is why I started this post to begin with! My first picture shows my stack of "T" or "Y" post jacks I have gotten. They range in length from 34 1/4" to 36 5/8". My second picture shows this differance in length and they all have the hole drilled in them near the end. My third picture shows the 34 1/4" jack mechanism and the 36 5/8" jack mechanism. Both Jims 9 E and my 9 J ( gray one on left ) have the shorter oval depressions and have masts 34 1/4" long. The picture of the jack from Nicks Garage 9 L and my 9 L ( black one on right ) have the longer oval depressions and have masts 36 5/8" long. So what I am wondering is at some point was there a revision in the jack from the manufacturer? My last picture shows yet another "T" or "Y" type mast with a mechanism that has NO oval depression dated 9 K? So we need more owners of original Superbirds to check the jack parts to hopefully clear this up or not? The Superbird jack handle is 31" overall folded up. The handle when opened up is 54 1/2". 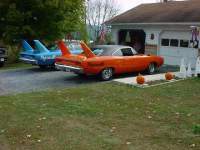 I have had a long time Superbird owner contact me about his bumper jack. It is a "T" or "Y" mast as I call it that is about 34 3/4" long by running a tape under the spare. The date code of the jack is a 9 J or September 1969. So from the two early date coded jacks I'm seeing a shorter 34 1/4 - 34 3/4 " length. take a minute and help us out.